I LOVE mockingbirds! They come around early spring, but I don't see them much after that. 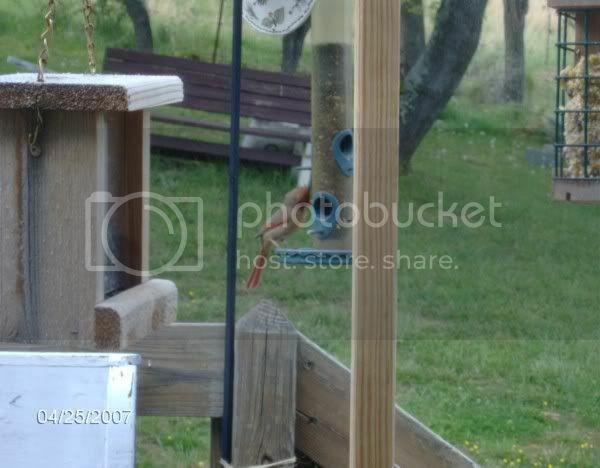 Anyone know what looks yummy to them in a feeder? I'd like to have more show up in the yard. You generally won't be able to have too many Mockingbirds in one location. They are territorial and will defend their territory. If your lot is larger enough, you might have one pair on one end of the lot and another pair on the other end, but they don't mingle very much. Yea, my cat can attest to that! LOL! Mocking birds are not only territorial but brazen, they have no problem "dive bombing" a person or cat. From what I see in my back yard, as far as them interacting with other birds, they only seem to mind the blue jays, the rest they basically ignore. Nature is amazing. Have you ever found a whip-o-will nest out in the woods? They will pretend they have a broken wing to lure you away from the nest. And as soon as you get within ten feet of them . . . they fly off a short piece and again pretend they can't fly. Other birds will do this too. I've seen cardinals do it when a blacksnake was trying to raid their nest. This is probably the cause of an old fable which says that blacksnakes can "charm" birds. Back when I was growing up many elderly people believed it. I had not seen a cardinal in years, until we went to TN. We were on our way back to our hotel room after walking the parkway (in Gatlinburg),when one landed right in front of me on the sidewalk. 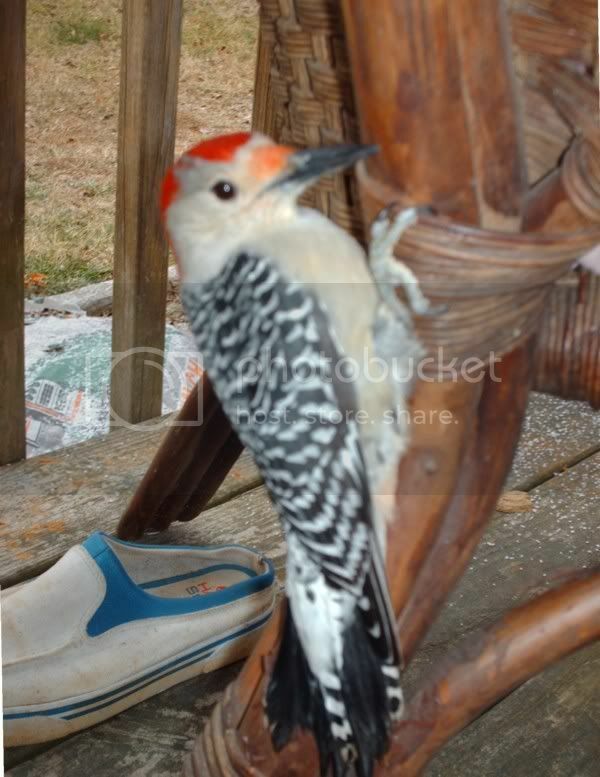 We'd been home about a month when lo and behold, we had a pair at the birdfeeders. They are still here. They are my favorite bird. 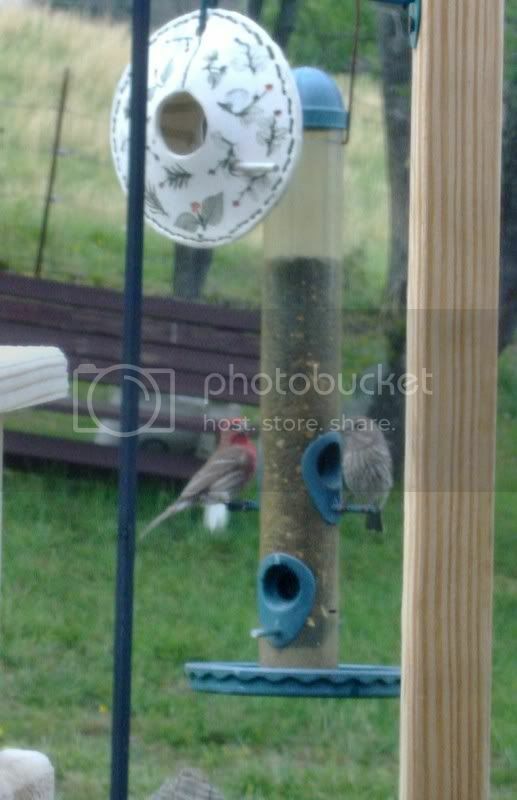 I have out 8 feeders and all kinds of birds. The past two springs I've had Scarlet Tanagers and Baltimore Orioles. Last year, we had am Indigo bunting. Hopefully they will return this spring. 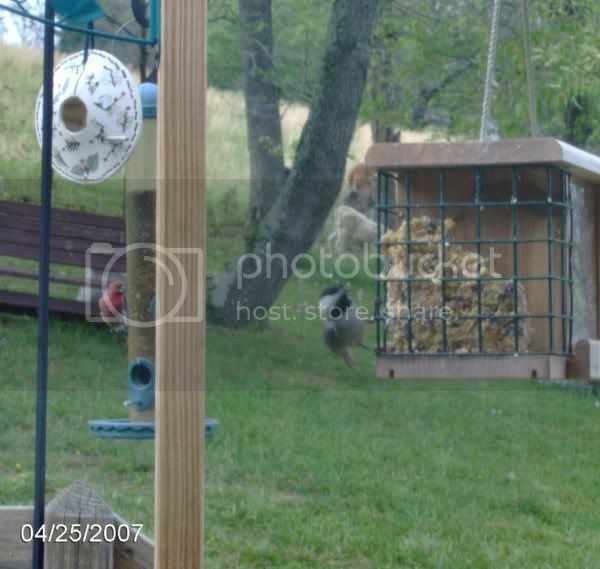 I use the shepherd hooks for my bird feeders. I have dozen of cardinals. And there's a mockingbird nesting just outside my office window in a large viburnum hedgerow. I have two families of cardinals in our yard. They are especially breathtaking in the winter, vivid bright red against the crisp white snow. They like to land on the tree in front of my picture window and I sit and watch them close up. 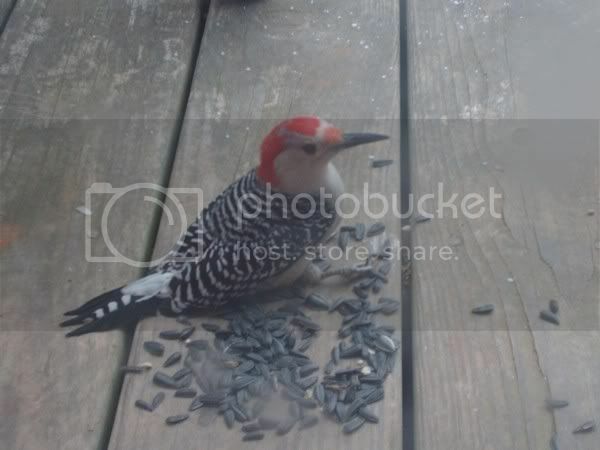 I found the pictures I had taken a month or so ago of the woodpecker that was very upset that I did not refill the corn block that was gone. I guess he wanted to bring our attention to it, but instead, ran into our back glass door and cleaned his clock! Poor little guy, but he was just stunned and I was able to get a few good pics of him before he stopped seeing stars and flew off. Here are some other of my friends. There's some fancy trim on the windows on the front of my house. Last spring a robin built a nest on the trim above one of the windows under the front porch. I just left it alone. 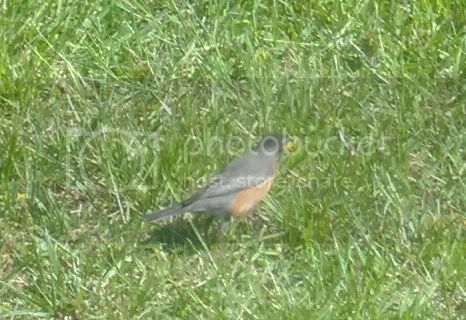 Every time I would go out the robin would flutter around and fuss at me. Ha! I know what you mean. 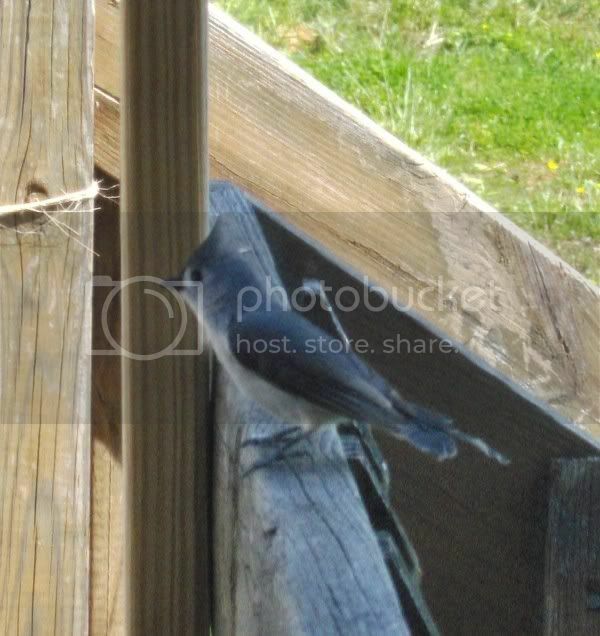 I have a small roof over my front door and it's a favorite nesting place for birds. Everytime I come in or go out the birds set off an alarm. It is also very visible to my cats from the window on the breeze way. They've been trying to get those birds for a long time. Thank goodness for glass.